Bali Rafting + Tanah Lot Sunset tour is an interesting Bali Rafting tour package, combining Bali white water rafting at Ayung River Ubud with a visit to Bali’s famous Temple; The Royal Family Temple of Pura Taman Ayun as one of the most beautiful Bali Temple, then visit the spices garden and Tanah Lot Sea Temple to have a chance to have a wonderful sunset. It’s going to make your vacation in Bali unforgettable. 10.30 – Start Rafting Adventure with 2 hours journey. 12.30 – Finish Rafting, Going up to restaurant for shower and changes. 13.00 – Having Indonesian Buffet Lunch. 14.30 – Visit Taman Ayun The Royal Family Temple. 15.30 – Visit Bali Spices garden. 17.30 – Visit Tanah Lot. 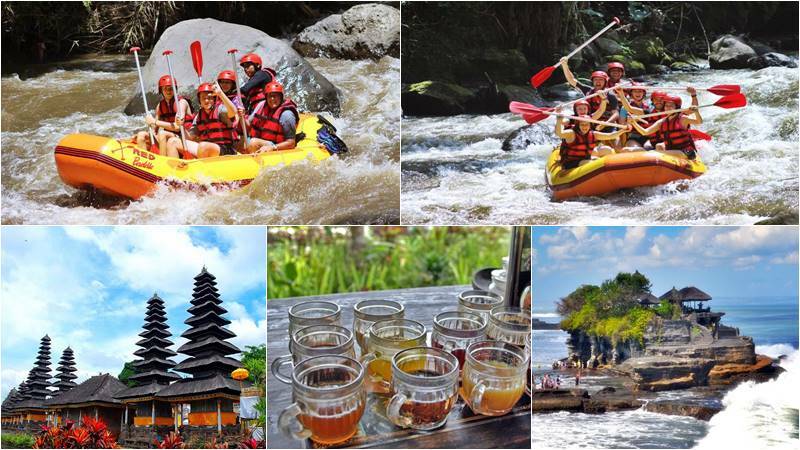 Join our Ayung River Rafting professional for fantastic Bali rafting experiences, enjoy a unique and unforgettable tour through winding gorges, the lush jungle and the magnificent terraced rice field. The water volume is stable throughout the year with few speeds of water, allowing you to have great fun with calmness. All participants will be fitted with life jackets and helmets from our beginning at the start point. Our experienced guides will lead you through your thrilling Ayung rafting adventure for around 2 hours. Follow his instructions and paddle along the way, laughing, shouting and experience a tremendous adventure. This is the best way of feeling the wonder of the Ayung River. Taman Ayun: the Royal Family Temple of Mengwi Kingdom was built in 1634 and is regarded as Bali’s second largest temple, and is also known as Bali’s most beautiful temple. There’s a lovely garden and a wide pond surrounding the temple. The word of Taman means: Garden and Ayun means: Beautiful, as its name. Bali Spices garden: When you’re coffee lover, we stop to try the coffees, ginger, tea and other local products at the spices garden. You can see in this location the traditional way of making Luwak coffee. Tanah Lot Temple: In the middle of the sea stands this Balinese Hindu temple in the solid rocky land. In the particular time of sunset, this temple is very beautiful. We can see this temple with a spectacular view of the sea and the sunset, from several spots. When the water goes tide we find a drift in the temple, because the sea waters surround this temple. During the low tide, the snake, who believe as the guardian of the Temple, can be seen by the visitor too.